The WHITE MUSIC boss, producer and DJ talks his hip-hop roots, music in Germany, his inspiration, and more. 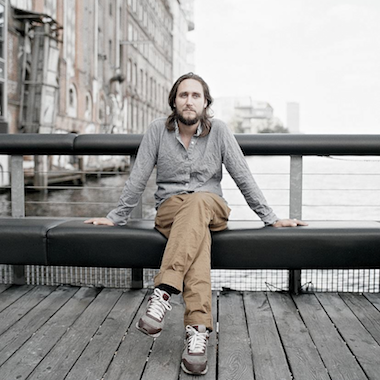 Producer, DJ, label head and Jesus Christ doppelgänger Oskar Offermann will play his first show in India at भ’s 2014/15 season-opening BBQ at Bonobo, Bandra on Sunday, September 14th (RSVP). In the middle of his working vacation of-sorts in South Asia, Oskar was cool enough to answer the questions we sent across to him about his musical roots, what’s kicking for him in the world of electronic music, his style of DJing and a lot more. भ | Oskar, you’re from Frankfurt. What was the music scenario like over there when you started out? And when did Berlin happen? OO | In my Frankfurt days I was pretty much into hip-hop. I was rapping and producing beats. I was a little bit into breaks and drum ‘n’ bass when I was clubbing those days. Today it seems like a logical transition to house and techno, which I discovered in Berlin for the first time. Before that, I never understood why you put a kick drum on the 2nd and 4th hit, where the claps are usually. LOL! I finally moved to Berlin in 2001 then to dedicate myself more to house music. भ | Can you list a few of your favourite hip-hop records, artists, or producers? What was the last hip-hop album or song you really liked? OO | In my crew at those days we were really into more abstract hip-hop, like Company Flow for instance. (The Company Flow album) Funcrusher Plus was very big for us. Also their Rawkus Records sampler contributions. In those days I also listened to things like Gang Starr and Wu-Tang… loved Premo [DJ Premier] stuff so much, also Nas of course. And Mobb Deep is still one of my favourite hip-hop acts from those days. ‘Shook Ones (Part II)’, is probably my all time favourite hip-hop track. भ | In 2012, the new “deep house” sound as we all know it really began to stagnate. Later that year, you released Do Pilots Dream Of Flying, taking elements from the roots of that style and folding it into a futuristic pot with these sharp, open beats, opiated vocals, both tense and free atmospheres, and more experimentation. To me, it’s got this house-and-techno-meet-Bowie-and-Talking-Heads-in-the-basement-cocktail-bar-of-5-star-Tokyo-hotel vibe running through it. Was this then a full-length album borne of instinct or was it more reactionary to what was going around in the space of 4/4 music at the time? And can you tell us why you picked that name? OO | Haha, very well said. I mean Talking Heads I love pretty much, but it wasn’t so much a real conceptual album. I didn’t plan on doing it this and that way, I just did music and whatever came out, I recorded. For me, vocals are always and important medium, since I don’t play any harmonic instrument. I’d love to be able to write real songs. I actually just bought a guitar and try to force myself to learn it because of that! 🙂 For the name – I love watching the clouds while sitting in a plane. So when I was in a state where I was flying back home from a party with not a lot of sleep I keep asking myself how it feels for the pilot. If they dream about these clouds and flying through them, because that must be the dream of all dreams then for me. भ | Your use of vocals is something I want to point out in specific because you use them sparingly but they’re usually all messages. A great example of that is ‘Test Of Time’ on Distance Is Depth. Is that intentional? And if it is, what’s your reason behind doing that? OO | I just like to use vocals sometimes for more tool-orientated tracks, because I have the feeling you really can get a message through to the people on the floor then. They are in the monotone trance-y state then and really listen. भ | What was your first and original vision and reason for making music when you started out and how do you think that has changed years down the line? OO | I started music because I wanted to express myself in some form, I guess. But to me, it is like asking me for what reasons do you eat food, for example. It was a need, an urge, an unexplainable desire from a power from a unknown place which attracted me. And it still is. It is just a need to do it, like breathing air. भ | Can you list a few albums/songs/producers/labels that you are looking forward to hearing in the future, anything great that’s caught your attention that you’d like to share with our readers? भ | I remember Tim Sweeney having to correct himself when referring to you (and Edward) as a Berliners. You preferred he use German, since you’re from another place but you happen to live and make music in Berlin. What was that about, and if you could separate the sounds coming out of Cologne, Berlin, Frankfurt, Munich by using distinguishing words, how would you do that? OO | Berlin is very diverse these days. But for me it has always been about these looooong parties and that is what I would describe the sound as… neverending. Cologne for me was always Kompakt and when I first got to know Kompakt in 2001 that was known as “minimal” (pronounced German). But I think it is more rooted in melodic, ’80s German disco, big roomy sound. More like Kraftwerks’s children in a way. Frankfurt is pretty much dominated by Sven Väth’s and Ata’s vision of clublife. And Munich I just don’t have a clear sound in mind. There are many younger guys changing the scene there like Public Possession, an amazing record shop and label you should check out. भ | Name the first rock ‘n’ roll record that comes to your mind. OO | I was born in ’81 so obviously it has to be Nirvana’s Nevermind. I was eleven when it really hit Germany. That was the first real rock record I was listening to. Of course, at that time I totally adopted the style of the time, fashion wise, because I was just a little kid. भ | Outside of music, where do you find the inspiration to continue on this journey as producer, as composer, as a DJ? I love traveling a lot. It give me a chance to explore new cultures and meeting new and old friends. On my travels I try to visit as much nature as I can, that gives me a lot of energy. I love the green. I hate straight lines. भ | You don’t play live sets, so how would you best describe the way you craft your DJ sets? OO | A good DJ for me is someone who is able to show the crowd a place they never have been before. In my sets I try to find this state of perfection, where everyone has their eyes closed and they trust me as a DJ. Then I can start to take them some place they never have been before and show them the beauty of it. Oskar Offermann has spent the summer sweating up hallowed dance floors in Europe such as Berghain/Panorama Bar, The Watergate, and even a Boiler Room B2B in Berlin with Edward (watch here). He brings his DJ game to our season-opening BBQ party at Bonobo, Bandra, on Sunday, September 14 with support on the decks from Kunal Lodhia (Grime Riot Disco) and the Bhavishyavani Crew. Details. Stay tuned for Oskar’s #WeeklyCutz playlist, coming this Thursday.